Pnoy's VIN D' HONNEUR is being held in Malacanang Palace today January 13, 2012. What is Vin d'honneur? Vin d'honneur is a reception usually following a particular ceremony, for example when an ambassador presents his credentials to the monarch. Vin d'honneur literally translates from French to "Wine of honour" and is akin to a prolonged social celebration after an official ceremony. It traditionally takes place at the end of inaugurations, speeches, and ceremonies that marks the social life of the French provinces. In the Philippine context, over the years it has come to be considered primarily a diplomatic event, which features a toast exchanged between the President of the Philippines and the Papal Nuncio, who is the Dean of the Diplomatic Corps (in Catholic countries or those that formerly belonged to the Spanish Empire, by tradition, the senior diplomat, or Dean, in in the diplomatic corps is the Papal Nuncio or ambassador, in other countries, the ambassador accredited to the country longest is the Dean). It is taking place this morning, in contrast to the afternoon or early evening practice in the past. This year’s vin d’honneur is the annual New Year’s Reception hosted by the President of the Philippines as head of state, and by tradition, after the President plays host to Philippine officialdom and the diplomatic corps, other departments in turn host their own New Years’ receptions for their own officials and staff. The rituals include guests entering the State Entrance of the Palace and climbing the main stairs, going into the Reception Hall where in the past, a reception line would have been formed. Guests are then escorted to Rizal Hall, the ceremonial hall of the Palace. The President of the Philippines then joins the assembled guests and proceeds to deliver some remarks, concluding with a toast to the prosperity and well being of the Filipino people. 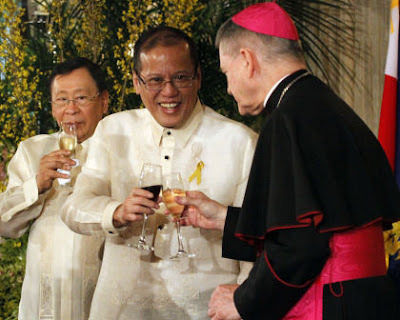 President Pnoy offered a toast for a prosperous and peaceful and new year for all of us in 2011. Pnoy told the gathering that he shares the optimism of Filipinos in the coming year, citing more investments and jobs. “Their optimism will be validated. This year, businesses will invest more in this country, creating new jobs for families. This year, government resources will be spent to uplift the lives of the poor. This year, the Philippines will once again be a voice in the world for freedom and fairness. "There will be challenges ahead—from an uncertain outlook for the global economy, to a noisy minority who want to rekindle the malicious practices of the past. But if we work together, we will overcome the challenges and fulfill the promise of the year ahead. We have much to look forward to." Among the spotted guests are Vice-President Jejomar Binay, members of the diplomatic community, Cabinet members, lawmakers, members of the judiciary, high ranking government officials, businessmen and two of the President’s sisters Ballsy Aquino-Cruz, her husband Eldon Cruz, Pinky Aquino-Abellada and her husband Manolo Abellada, Senator Antonio Trillanes, Manila Mayor Alfredo Lim, Chinese Ambassador to the Philippines Liu Jianchao, Philippine Ambassador to Japan Manolo Lopez, SM’s Teresita Coson, Jaime Zobel de Ayala, Senator Tito Sotto, former House Speaker Jose de Venecia, Regal Film’s Lily Monteverde and daughter and producer Roselle Monteverde-Teo, AFP Chief of Staff Ricardo David, PNP Chief Raul Bacalzo, Senator Tito Sotto, Congressmen Erin Tañada, Aurelio “Dong” Gonzales and designer Paul Cabral.